Gavipuram, the historic settlement near Basavanagudi in South Bangalore predates the old city of Bangalore. Today the area exhibits a mix of urban form and vernacular style but certain pockets of it still retain its historic character. 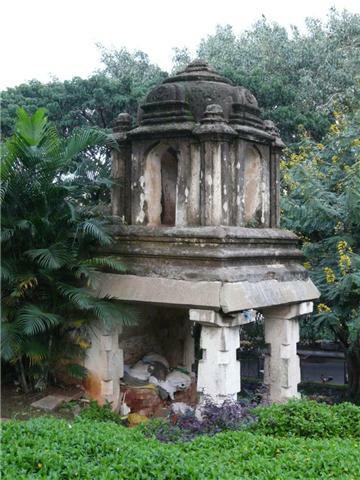 Join us to experience this setting and to find out the link between this place and the founding of Bangalore city! Along the way visit a legendary cave temple, see some stone monoliths, the house of a Gnanpith awardee and learn about the area’s cultural footprints – past and present. NO REGISTRATIONS, JUST WALK IN AT 4pm! Udayabanu Kala Sangha is on your right after Vivekananda Yoga Kendra, when you come down Hayavadana Rao Road, which leads off from Ramakrishna Ashram Circle on Bull Temple Road. 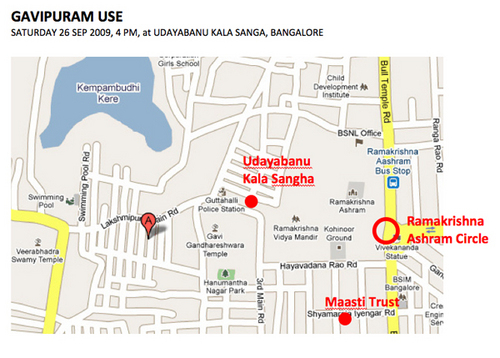 Ramakrishna Ashram Circle is at the end of Vani Vilas road in Basavanagudi, which leads to Lalbagh West Gate. Look for a BCP banner at the entrance to the Kala Sanga. - Remember to bring a cap, umberella, bottle of water and some snacks. - You can park on the road near the Kala Sangha. The event will close at the Maasti Trust, a short walk away (less than a km). - Overall the walk will be about 4 to 4.5 km and the event will last 2.5 hours, from 4 pm to 6:30 pm. The event commenced at Udayabanu Kala Sangha with a brief introduction to BCP, UDBHAVA and current BCP events by Prof Sathya Prakash. 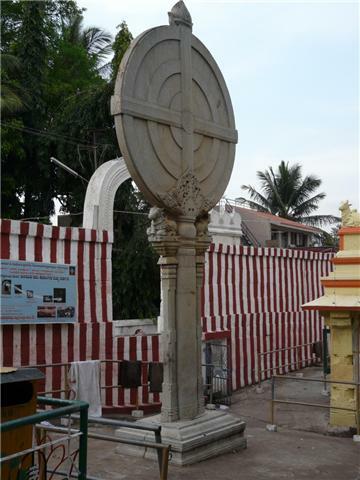 He introduced Gavipuram, 'the place with a cave' and summarised the walk which would start with the area's historical footprint at Kempegowda Tower, move onto its religious footprints at Gavi Ganga Dhareshwara temple and finally end with a glimpse of its cultural footprints at Maasti Venkatesh Iyengar's residence. Mr Narasimha, Secretary of the Kala Sangha then introduced the area cultural legacies, past and present starting from Ramakrishna Ashram, Vivekananda Yoga Kendra and the State Award winning Kala Sangha itself. We then set off west and reached the tower after a 15 min walk. Pankaj described the structure's history and relevance to the founding of the city. The tower and its setting, a State Government protected monument, doesnt seem to be maintained properly, residences have come up right next to it, the rock and tower on it have been painted in various colours and the approach is not properly laid out. However the view from the tower made up for all this and we retraced our steps towards the Kala Sangha and entered Gavi Ganga dhareshwara temple premises by walking through the old priests' settlement (Agrahara) next to it. The temple was a hive of activity as it was one of the days of Dussehra (Navaratri) and there was also a film shooting in progress in the square in front of the temple. 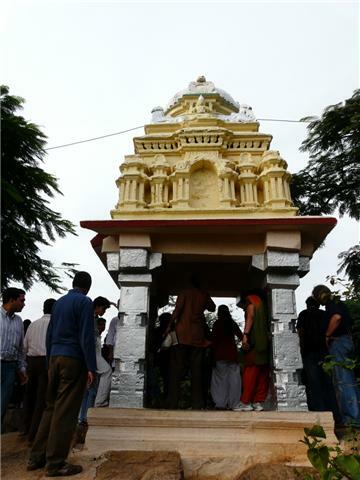 Prof Sathya spoke about the temple and its uniqueness - situated within a cave and with four tall stone monoliths at the entrance not only proclaiming the principal deity but also with possible astronomical significance. 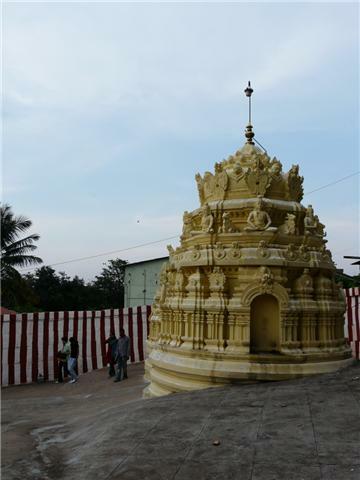 We then climbed up Hari Hara Gudda (Hill) behind the temple, pausing on the way to see a dilapidated tower similar to Kempegowda's tower, a stone monolithic parasol, two other ruined mantapas and the reconstructed Hari Hareshwara temple. We descended the other side and after a brief walk came to Dr. Maasti Venkatesh Iyengar's house, now a Trust presided over by his grand daughter, Dr Vasantasree. She spoke to the group about her grandfather and his works and shared some anecdotes from his life which was most interesting. We started off as a group of about 20, which became about 40 mid way through. The group was a mix of foreign nationals and locals (mainly architecture students of the nearby BMS School of Architecture). We had put up posters in the neighbourhood and surroundings, advertising the event but this does not appear to have elicited any response. However, the response was positive as the group was all new comers who were participating in a BCP event for the first time. 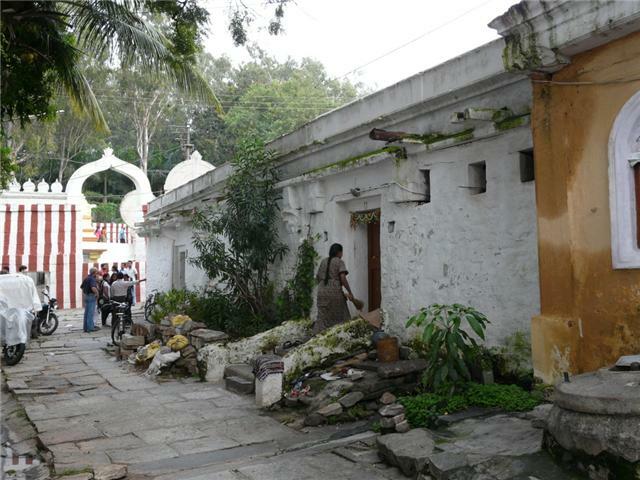 They enjoyed this glimpse into a forgotten corner of Bangalore.